The Scratching Post – 2013 Issue No. 1 – Tails High, Inc. The Scratching Post is back! Please enjoy the Tails High newsletter and if you have any ideas for articles or would like to submit something of your own, send an email to Beth who will write or edit the article for inclusion in our next edition. The Combined Federal Campaign (CFC) Starts Soon! CFC is the world’s largest and most successful annual workplace charity campaign, with almost 200 CFC campaigns throughout the country and overseas raising millions of dollars each year. Pledges made by Federal civilian, postal and military donors during the campaign season (September 1st to December 15th) support eligible non-profit organizations that provide health and human service benefits throughout the world. The Tails High CFC number is 23910. We’ll remind you as the time for making selections approaches, but hopefully you will give our CFC number to your animal-loving friends, neighbors, and family who are Federal employees and ask them to consider allocating a part of their CFC contribution to Tails High to enable us to rescue more homeless cats and kittens. All donations are used to purchase food, vet care, medicine, and other supplies for the cats and kittens that are cared for by Tails High volunteers. 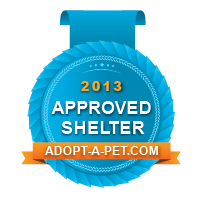 To help people see we’re worthy of their support, encourage them to visit our website, http://www.tailshigh.org. Tails High Celebrates it’s 4th Anniversary! It’s Tiny Tim here although my new family likes to call me Peanut. Thanks for putting my story up on your website. My new parents found me there and even after all of my eye surgeries and escape adventures, they still had to have me. I had my final surgery to help my eye shut and I’m so happy to have that cone of shame off for good! lays around a lot. 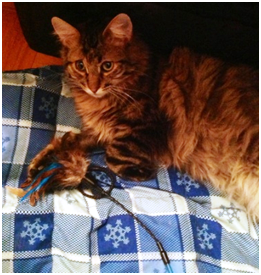 I’m so happy to have playmates but I’m ecstatic that I still have my favorite feather toys. I’ve staked out a great spot on top of this super cool tower and I like to spend my days sunbathing up there. The nights are for tracking down those toys with all the bells in them but I think it makes my new mom cranky in the morning. I wonder what that’s all about. My new dadseems to enjoy it and even wakes up real early in the morning to play with me. Thank you guys again – especially Leni and Ronnie and everyone who made donations to help pay for my surgeries – for being so wonderful and helping me find this awesome new family. Keep in touch and send more catnip if you can. You can never have enough! Q. Are there cats out there for people with allergies? A. Low allergen or “hypoallergenic” cats are known to produce fewer allergens than regular cats. Note that the key word here is “fewer.” No breed is completely non-allergenic. 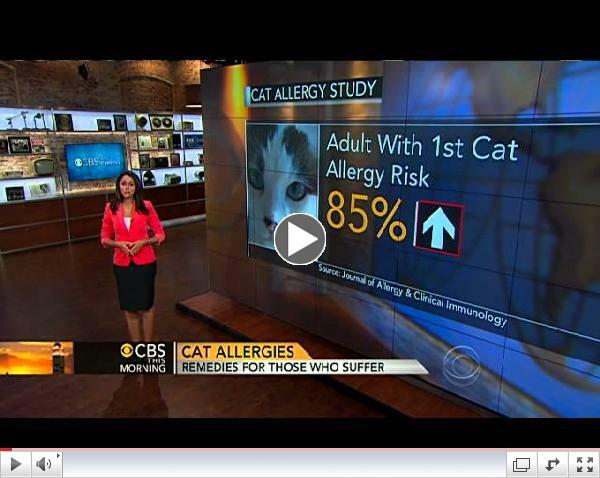 The protein Fel D1 is the allergen in cat saliva that causes problems for allergy sufferers. ; Some cat breeds produce less of this protein than others, making them hypoallergenic. These include the Balinese, Oriental Shorthair, Javanese, Devon Rex, Cornish Rex, Sphynx (hairless), and the Siberian. It’s important to understand that adopting a “hypoallergenic” cat may still trigger some allergic reactions. The Foster to Adopt program allows people to test out a cat and your reactions to them. There are also steps you can take to minimize allergens such as frequent baths and brushing, and washing toys and bedding. Males produce more allergenic secretions than females. Intact males produce more than neutered males. Dark cats tend to produce more than light-colored ones (no one knows why). Kittens produce fewer allergens than adults but they eventually become adult cats because we just haven’t been able to figure out how to make them stay kittens! We are currently looking for donations of World’s Best cat litter for the many kittens in our foster homes. Thank you so much! Our next issue will feature a story on how Tails High brings kitties into the rescue as many of us have always wondered, “What does it take to save just one cat?”. Kelley has been with Tails High since it was founded in 2009. She was formerly the President and Adoption Coordinator for the rescue. Below is a funny story she has shared with us. One lazy Sunday afternoon a call came in to Tails High from a gentleman on a cell phone. He was rather animated and the connection wasn’t the best, but Kelley did her best to listen. He said he was calling to alert us of some homeless feral cats in the back parking lot of the Best Western hotel “in Alexandria” on N. McArthur Street. Kelley thought to herself that McArthur is a Blvd and not a street, but it sounded fine. The man said that one of the kitties was very, very young and asked if we could help. He said he would love to help but he was on vacation in New Orleans. He pinpointed the location to Exit 58 off of 395. Kelley hopped in her car and went to find the kittens. She drove around and around Alexandria near 395 looking for the Best Western Hotel on McArthur. Highway 395 and 495 run into each other and cause confusion at times so she allowed for some error room on the location. Eventually Kelley decided to go home and look up the Best Western’s address. Then she remembered that the McArthur Blvd she knew was in DC and not Alexandria. Then she thought about how the man said he was on vacation in New Orleans…. Too weird, she thought. When Kelley typed in the address on the computer the location that popped up was in Alexandria alright. ALEXANDRIA, LOUISIANA!! She called the man back who really had thought we were in Louisiana and advised him to call the local animal shelters down there who could put him in touch with some more conveniently located animal rescues.